For a commercial greenhouse operation to remain sustainable, irrigation practices should be modified to better manage limited water resources as well as manage non-point source pollution issues. We have the technologies to do this in many forms, including waste water capture and recycling water in greenhouses, yet acceptance is low due to the costs of implementation as well as inadequate technical information. Early in my career at Colorado State University, I worked with Sean Moody, a graduate student who completed a study on growing poinsettias using strategies to reduce leachate and. His study used two cultivars, Eckespoint Freedom Red and Gutbier V- 17 Angelika Red (provided by the Paul Ecke Ranch), which were subjected to three irrigation strategies: 10% leach, ebb-and-flood and no leach or pulse, at two constant liquid feed fertilizer rates, 150 and 300 ppm N from 15-5-15 Cal-Mag Plus from O.M. Scott. Heavy leaching of water and fertilizer is not an acceptable and sustainable production practice. Most fertilizer recommendations for poinsettias suggest 200 to 400 mg·L-1 nitrogen (N) applied at every irrigation. Ebb-and-flood (Fig. 1) is one alternative to heavy leaching, but there is a high investment cost in equipment and maintenance. When using ebb-and-flood or pulse irrigation, which is accomplished with small frequent irrigation applications applied to saturate the media with no leaching, fertilizer concentrations must be reduced to avoid high electrical salt build up in the root-zone medium. Pulse irrigation is a modification of a conventional irrigation system that applies water at reduced volume with little or no leach. Pulse irrigation strategies can be designed using conventional micro-tube irrigation emitters. However, the irrigation controller must be sophisticated enough to provide precision control in fractions of a minute. 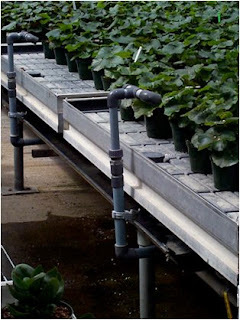 Additionally, pressure compensated emitters must be used to ensure that each pot receives the exact same volume of irrigation solution from one end of the bench to another. The study was conducted from week 34 (transplant) through week 47 (anthesis) in a FRP-glazed greenhouse. The plants were grown in 6-inch azalea pots using Premier Pro-Mix HP. All plants on the ebb-and-flood benches were irrigated when approximately 2.5 cm of moist media remained at the bottom of the pot. The irrigation solution was pumped from the holding tank to the containers bench top, held for 10 min., and drained back to the tank for later recirculation. Fertilizer solution was added to the tanks when the level dropped below half to maintain enough solution to sufficiently flood the benches. Pulse and 10% leach strategies were calibrated to where the leachate was equal to zero and 10% of applied solution, respectively. Pulse irrigation was conducted once daily until week 40 and twice daily subsequently at 900 and 1300 MDT study. The 10% leach plants were irrigated daily. 'Angelika Red' dry weight, height, and width were greater than 'Freedom Red' as one would expect. Fertilizer rates did affect plant growth in this study, thus those data were pooled. Ebb-and-flood irrigation only slightly reduced plant width of 'Freedom Red' (Fig. 2) and pulse irrigation slightly reduced plant width of 'Angelika Red' (Fig. 3). Other studies have reported that sub-irrigation treatment or no leaching yields poinsettia plants of similar size. Irrigating to 10% leach resulted in the lowest EC values for poinsettias, followed by pulse, while ebb-and-flood had the highest EC values (Fig. 4). The top medium layer had higher EC values for all three irrigation strategies, which was expected due to the wicking of water to the surface of the medium. The EC value of the top layer from the ebb-and-flood irrigation at 300 mg·L-1 N resulted in an EC value 1.5 times greater than that normally thought to be injurious to plant growth (>8 mS·cm-1). Even the middle and bottom layers of the containers from the ebb-and-flood irrigation at 300 mg·L-1 N had EC values greater than 4 mS·cm-1, which is considered to be too high, i.e. 4-8 mS·cm-1. At 150 mg·L-1 N, the top layer for ebb-and-flood as well as pulse irrigation had a relatively high EC value of approximately 4 mS·cm-1 or greater (Fig. 4), but all other EC values for the other layers of the container were within acceptable levels, between 2-4 mS·cm-1. The EC values for the 10% leach irrigation at 150 mg·L-1 indicated low fertility; whereas, at 300 mg·L-1 was adequate for good plant growth. Poinsettias of acceptable quality may be successfully grown using ebb-and-flood or pulse irrigation strategies at constant liquid feed fertilizer rates of 150 mg·L-1 nitrogen (N). No leach irrigation practices in excess of 300 mg·L-1 N may result in excessively high EC values resulting in poor plant growth. These practices effectively reduce runoff as and can be adopted to reduce the non-point source pollution risk of a greenhouse. thank you for the proffesional article. i think the all agriculture need to work with irrigation system and the private gardens to.